I am so excited to be writing this review, it's really hard to type, while doing the happy dance. The Taker (Book 1) was by far, my favorite book of 2011. 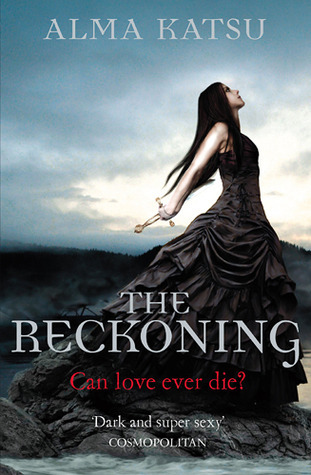 When I received The Reckoning (Book 2), I was very excited. Alma Katsu is an amazing storyteller. What goes on in that brain of hers, let me just say... it's pure awesome. I could always read about Lanny and Adair, their story could go on forever, and it doesn't get old. When I started this book, I knew Lanny was in deep, deep trouble. I am saying this because of her actions, in the first book. It actually made me nervous, for Adair is not someone to be trifled with. She was so very brave in The Taker. Lanny is very smart though, however she was constantly running and looking over her shoulder in this book, very climatic. Adair actually grew on me more this time around, than in The Taker. He was such an evil, evil sinister person, it was a little unnerving. In The Reckoning we get to read about another side of Adair. It is refreshing how this very unusual love story just keeps twisting and turning. There is no way anyone will figure out how the third, in this trilogy, will end. I really like the formatting of this series as well. Just like book 1, The Reckoning takes you back and forth from present day to, oh let's say... Morocco 1830 or Romania 1300's. If this book is not taking you way back, then you are in present day Michigan, Maine, Aspen, Boston, Barcelona, Casablanca, and Italy. I really cannot tell you how much this series amazes me. It is haunting, evil, lovely and very romantic all at the same time. I seriously cannot stop thinking about these books, when I am not reading them! The last in the series The Descent coming out in 2013, is very much anticipated. Please tell me which cover you like better, in your comments below! Me and Alma Katsu! AWESOME! This is an adult book, so I did not do a Parental Book Review. Adults only please! I haven't read The Taker, but I have to say that I like the cover of the face with the feathers better. I think it matches the first book better and I am getting a bit bored with the cliche girl in a dress cover. They are both pretty, but I prefer the one with the feathers. I think it's more eye catching. I do love the feathered cover and the new treatment on THE TAKER pb edition as well. I started THE TAKER a couple of weeks ago in the midst of a big reading rut and it was one of four books I abandoned. I plan to get back to it since I've heard only great things about it. Thanks to this review of RECKONING, I'll have to do it soon. @Amy just took the words right out of my mouth :) The first cover is much more captivating than the girl in a dress cover. Both of these covers are completely gorgeous. Although I wish pubs would stop putting quotes about love never dying on book covers. ENOUGH. Slight spoilers from book 1. Getting Adair's pov in this book should be interesting. I can't believe it didn't hit me THEN (when I read The Taker) that the love story was between Adair and Lanore, not Lanore and John. After all the book was named after THEIR love story. 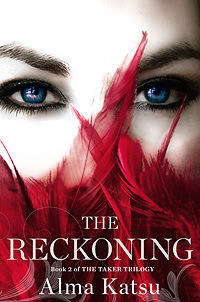 the reckoning book 2 cover is divine! Look at that first cover! It's breathtaking! I just finished this book as well and it was amazing! The story really grabbed me (just like the taker) and I loved all the different locations. This series is easily becoming one of my all time favourites.